How many times do you say, think, or feel I’m tired? I do. 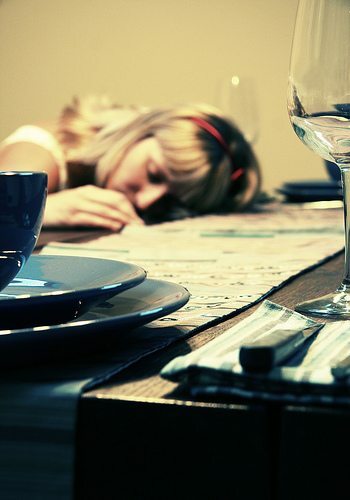 Do you know the difference between just being tired and being fatigued? I considered them pretty equal until now. Do you ever wish you had more energy? Um, of course who doesn’t?!? …it was late summer in 2004 when I decided to run a marathon. I turned 30 and had a “things to do at least once in my life or before I die” list. Running a marathon was number 2, right after skydiving. So I went to a Team In Training information meeting, talked to the coaches, and took home some information. A week later I joined the Fall team and began the grueling process of training to run a marathon. I was excited and emailed my old college track coach. He thought it was funny that a sprinter was running distance — so the challenge was on! We ran our long runs on Saturdays and at first they weren’t very long. Newbies such as me started out with 2 miles and gradually worked up in distance. When I reached the distance of 10 miles, I noticed that I started taking ridiculously long naps after each run! I would sleep the entire afternoon, wake up and go back to bed for the rest of the night! I couldn’t believe I was so tired. I consulted my primary care physician and his response was, “Of course, you’re tired you’re running 10 miles. Stop doing it and you won’t be so tired.” I was disappointed in how quickly he dismissed my concerns. The tiredness didn’t go away. A few weeks later I went back to him he ordered a test for mono. The test came back negative but the tiredness remained. It wasn’t until about a month later at my annual gynecologist appointment that I finally got an answer. I mentioned how tired I was feeling to the nurse practitioner and she assured me that it sounded unusual. She ordered a full thyroid panel test. The MayoClinic.com defines fatigue as a lack of motivation to do anything, accompanied with a desire to sleep. Lifestyle, psychological and medical conditions are all factors that are associated with fatigue, including thyroid disorders such as hypothyroidism (under-active thyroid) and hyperthyroidism (overactive thyroid). Our thyroid gland is butterfly shaped and sits just above our collarbone in our neck. It produces the hormones thyroxine (T-4) and triiodothyronine (T-3). T-4 and T-3 help regulate our metabolism and extract energy from food. Calcitonin is also produced by our thyroid to help control the amount of calcium in our blood. Hypothyroidism, an under-active thyroid, is when your thyroid doesn’t produce enough hormone. Hashimoto’s disease is a form of hypothyroidism. Hyperthyroidism, an overactive thyroid, is when your thyroid produces too much hormone. Grave’s disease is a form of hyperthyroidism associated with the overproduction of T-4. There are two types of thyroid test. One only measures the level of thyroid stimulating hormone in your blood and the other measures the levels of T-4 and T-3. I believe it is important to ask for a full thyroid panel. Why? Because the first test my primary care physician ordered only looked at my TSH (thyroid stimulating hormone) levels and they were fine. The problem was found in the second test (a full thyroid panel) ordered by my nurse practitioner. My uptake was low. I now take a synthetic hormone that basically helps my body efficiently use the hormones produced by my thyroid. This disease affects not only women, but men too. This disease is mostly associated with senior women and men when the metabolism is expected to slow. However, thyroid disorders can develop at any age. I was only 30 when I was diagnosed. According to American Thyroid Association Guidelines for Detection of Thyroid Dysfunction, adults should be screened for thyroid disfunction beginning at age 35 and continuing every 5 years. Thyroid disease and Celiac Disease appear to go hand in hand according to an article by the Gluten Intolerance Group and listed as reference on the National Institute of Health’s website. Those crazy long naps and feeling so tired all the time coupled with weight gain were symptoms of my thyroid disease. I felt unsure of myself especially when my own primary care physician was telling me that nothing was wrong with me. This is a disease that affects millions of people (men and women) and is easily misdiagnosed. It is important to know our family history and to accurately fill out those charts for our doctor. It is also important to communicate with our physicians and if they aren’t listening then seek someone who will. I was lucky my nurse practitioner took the time to listen to me and ordered the right tests. Oh and, of course, I found a new primary care physician. I found out a year and a half ago that I have hypothyroidism, specifically Hashimoto’s. I then found out, through this book, Why Do I Still Have My Thyroid Symptoms, that gluten was the reason for my thyroid issue. I don’t have celiac’s but I do have a gluten intolerance. Check out the website for the book. http://www.thyroidbook.com Taking gluten out of my diet has made the biggest difference for me!! Thanks Leah! Yes, I’ve read a few articles that talk about a possible link between gluten and thyroid disorders. Cutting gluten is hard and I do my best. When I fail to cut the gluten I definitely notice a difference. Thank you for website. I’ll check it out. I was diagnosed with hyperthyroidism when I was 24. I had radioactive iodine therapy several months later and now have developed hypothyroidism which results in taking a synthetic thyroid hormone for the rest of my life. Since that time my mother and four sisters have been diagnosed with hypothyroidism. It was not easy for them to get the doctors to give them the full thyroid panel and they had to get pretty pushy about it. If thyroid problems have been diagnosed in your family and you have concerns, make sure you get those tests. Thanks for the shout out on that one Tabitha! Thanks Patti, has your doctor mentioned avoiding gluten as part of managing hypothyroidism?